Project to honour thousands of Jews who braved Catalan Pyrenees to escape Holocaust. 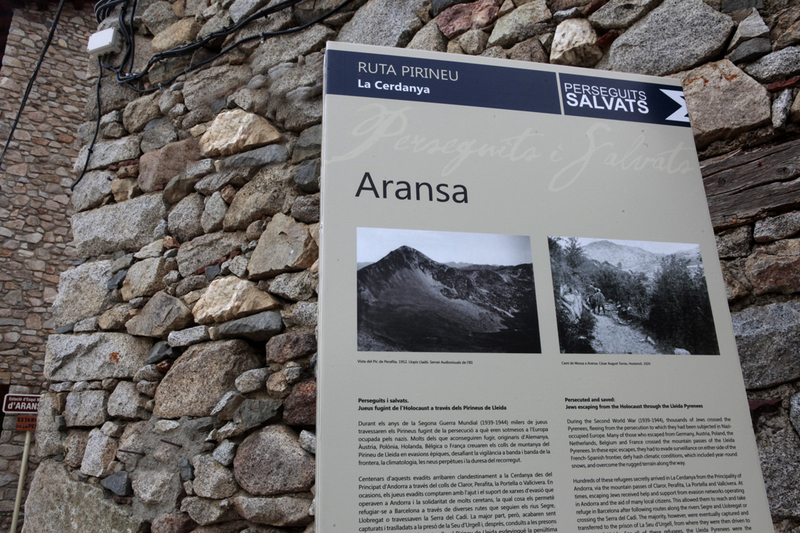 The Lleida Provincial Council promotes a project entitled 'Persecuted and Saved' that aims to explain the way that 80,000 fugitives, of whom 20,000 were Jewish, fled the Nazi horror during the Holocaust via the Catalan Pyrenees. The routes will include the pathways that the terrified fugitives took through the mountains, as well as prisons and concentration camps set up to hold those who were caught. The Diputació de Lleida (Spain) is a supramunicipal institution committed to the promotion of local initiatives and to the international projection of the region. Its activity is focused on the implementation of policies favouring a comprehensive development of the territory, with a special emphasis on the services and activities that strengthen the community. Since 2014, Diputació de Lleida has been promoting the project "Persecuted and Saved" with the aim of recovering the memory of the passage through the Pyrenees of Lleida of thousands of Jews who fled the persecution they were inflicted in nazi occupied Europe between 1933 and 1945. At the same time, it intends to acknowledge the collaboration and support the inhabitants of the Pyrenees granted to those who fled from barbarism and more than likely death. This project is based on thorough historical research that has benefited from the documentation kept in Spanish and international archives and from the recording of the life stories of the protagonists (Jews and people who collaborated in their flight). - Recovering and signaling of seven among the most emblematic escape routes. - Transforming the old prison of Sort, town in the Pirenees, where many Jewish families were held, into a museum. - Producing two documentary films about this historical episode. Publishing books on this subject. - Edition of informative and tourist promotion leaflets about the routes. - Website development: 'Persecuted and Saved'. All contents are presented in Catalan, Spanish, English, French and Hebrew. During Second World War (1939-1945), Spain became a refuge to around fifteen thousand Jews fleeing the persecution they were inflicted in countries dominated by the Third Reich. Jews born in Poland, Germany, Austria, Russia, Belgium, Holland or France arrived to the Iberian Peninsula during these turbulent years. As Europe was occupied by the nazis, Spain and Portugal, despite both countries being governed by fascist regimes, became the only escape route from the continent thanks to their maritime connection with America, North Africa, Great Britain and Palestine. The Pyrenees mountain range was the scene of the passage of these refugees. In most cases, they were families formed by grandparents, children and grandchildren and, on other occasions, young people or children whose relatives had been deported. Between 1939 and 1940, those who could produce the required documentation (passports and visas) to the authorized custom offices and had a ship ticket to leave Spain or Portugal were permitted free passage. After 1940, Spain, put under pressure by Nazi Germany, toughened the procedures for the granting of entry visas. It was then when the clandestine passage through the mountains began. Those intending to flee had to face long journeys hiking across rugged and inhospitable terrain, walking at night enduring cold, fog and snow while pursued by the French and German police who guarded the border crossings. These were epic and dramatic evasions since many of the fugitives suffered accidents or frostbite which caused deaths, fractures, amputations and much suffering. These people left behind a lifetime and that of their ancestors in Europe. In Spain, they were welcomed with great solidarity by the inhabitants of the Pyrenees. The attitude of the Spanish government varied as the war progressed. Refugees who fled clandestinely were usually detained and imprisoned in small Spanish prisons. Some were interned in concentration camps and others had a more placid stay in hotels. The action of Jewish humanitarian organizations such as the American Joint Distribution Committee, the International Red Cross and some allied embassies allowed for the conditions of their stay in Spain to improve. Thanks to the intervention of these organizations, the refugees managed to emigrate, mainly to America or the then British protectorate of Palestine. The province of Lleida, bordering France and the Principality of Andorra, played a prominent role in this historical episode. Recent studies estimate that some 5,000 Jews crossed the difficult summits of the Pyrenees and were saved from Nazi persecution through the territory of Lleida. ERASMUS + DECRA (Pula, Croatia) .